Start your next remodeling project in Corpus Christi, TX! From shower remodeling to custom bathrooms, room renovations and more, we are here to help. Call locally or click below. BKR Pros is a leading residential, industrial and commercial remodeling company with affiliates in Corpus Christi and the Central City, TX area. We have more than 10+ years experience in all phases of remodeling and specialize in custom shower and bathroom renovations. It's never too early to start collecting visual images that embody aspects of what you want your bathroom to look like. Thumb through magazines and books for ideas or check out various design websites. Clip photos that show your favorite design ideas and product possibilities, and put them in a folder. Attend open houses and take notes; visit showrooms and pick up manufacturers brochures. Put them in your folder too. Then you have plenty of concrete examples of what you like. Social media may be another wise avenue to browse for ideas. From the info you compile, develop three lists. On one, write down all the features you want to include; on the second note any features you know you don't want; and finally, compile a wish list of items to be included in the space if your home and bathroom and your budget for shower remodeling allows. Do some browsing in hardware stores, home centers, and furnishing shops to see what things cost. Remember, you can always pare down your list later to fit the budget. Now is the time to dream! No matter what your shower needs are, our remodelers are here to help. Add a separate shower: This is a popular remodeling choice. Most accidents occur when people are climbing in an out of a bathtub. If you can do with a shower instead of a tub, a walk-in shower without a threshold will reduce the risk of falling. To make your shower safer, equip it with grab bars, a bench, and storage alcoves that eliminate the need to reach far or stoop. Shower doors should be made of laminated glass with a plastic interlayer; tempered glass; or an approved, shatter-resistant plastic. No lighting fixtures, electrical outlets, or switches should be within reach of a person standing or sitting in a tub or shower, as a general rule. Resurface a bathtub: Pedestrian as it may seem, resurfacing an old tub can go a long way towards brightening a tired bathroom. If you live in an older area of Corpus, this is especially true! A new coat of epoxy paint can cover up an unsightly color or chipped finish without the mess and expense of replacing the whole fixture. It's a job for professionals but can be done without moving the tub. 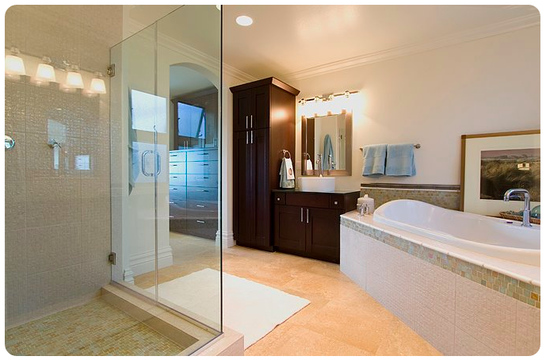 In the example above, a facelift took a 1960's style bathroom and transformed it into a more modern look. Before the makeover, the bathroom was sound but lacking in style. All fixtures stayed in their original locations; the sink was replaced however. This is just a small example of the work the team at BKR Pros can do for you. Call us locally in South Texas for more info and to get started!